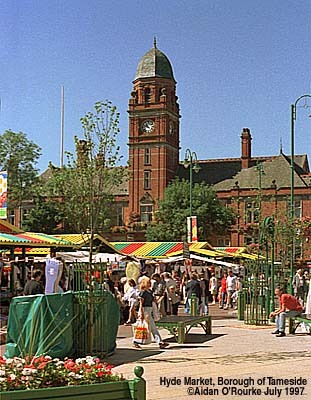 TAMESIDE Metropolitan Borough lies in the east of Greater Manchester, and was formed in 1974, bringing together previously independent towns and villages on either side of the old Cheshire Lancashire border, marked by the winding River Tame. 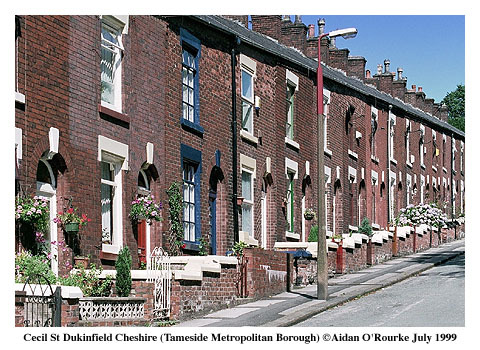 Mention Tameside, and I think of red-brick streets of terraced houses, both flat and on hillsides, factory buildings and chimneys, meandering rivers, deep valleys, hills, moors, woods, country pubs, proud Victorian town halls & Edwardian municipal buildings. More recently, I associate Tameside with the massive M60 motorway construction site, and with new trading estates springing up on former waste ground. 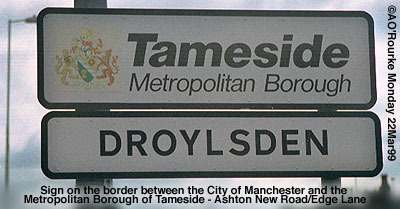 There are three main routes into Tameside from Manchester - the A635 Ashton Old Rd, the A662 Ashton New Rd and the A57 Hyde Rd. Long straight vistas lead the eye from the flat western suburbs into the rounded foothills of the Pennines, forming a spectacular backdrop to the east. 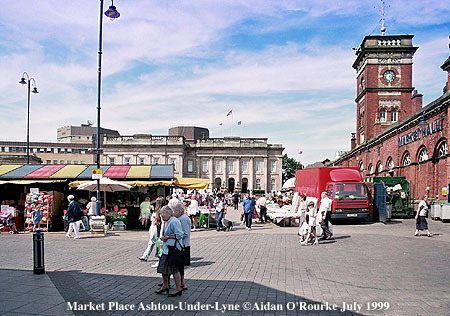 Both Ashton Old & New Roads take you into Droylsden, effectively a continuation of the City of Manchester's eastern suburbs. Just near here is Fairfield Moravian Settlement - a church-owned community of northern English red-brick terraces laid out in a style reminiscent of the Czech lands. 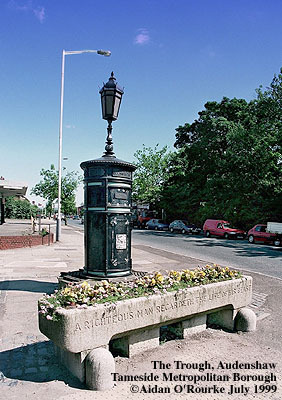 Not far from here is the Trough, for centuries an important staging post on the road from Manchester to Ashton. 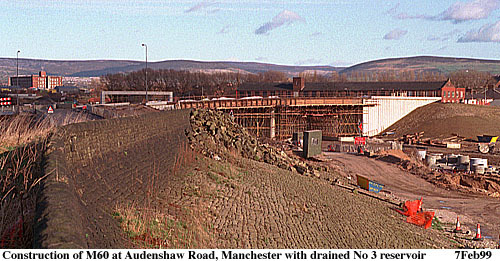 Keep going across the M60 - in 1999 a huge building site - and you reach the "capital" of Tameside, Ashton-under-Lyne. 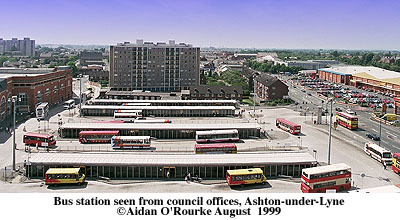 This is the seat of Tameside Council, in their large new office buildings overlooking the bus station.Metrolink trams will soon terminate on the site of the houses centre right in the picture abov e.
The old Town Hall is now the Museum of the Manchesters, telling the story of the Manchester Regiment. Two years ago I photographed the then Irish President Mary Robinson (right) on an official visit here. 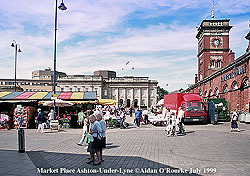 The Museum overlooks Ashton Market, held here since the middle ages. Other attractions include Ashton Parish Church with its stained glass windows and magnificent views, the ornate Victorian Museum and Art Gallery, and the recently-reopened Portland Basin Heritage Centre - we were there yesterday, it's superb: Relive childhood memories (if you're that old!) in a reconstructed terraced house from three quarters of a century ago and try on locally produced felt hats of yesteryear. It's interactive, fun and free to enter. Definitely recommended! 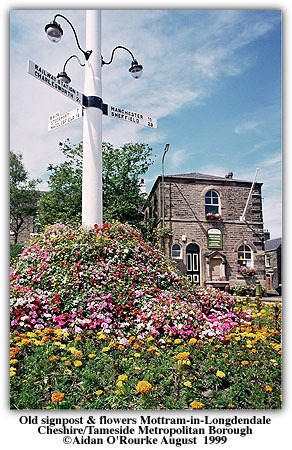 Cross the Tame south of Ashton Lancashire and you're in Dukinfield Cheshire -well, it's all Tameside, but people still write the old counties in postal addresses. 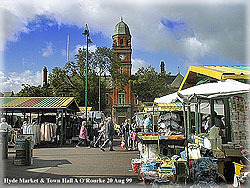 The Council would like people to use Tameside, but hundreds of years of history can't be changed in just 25. 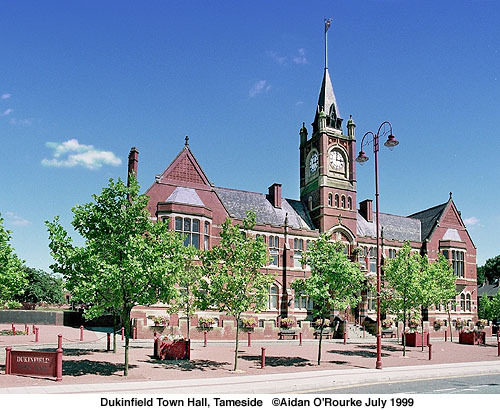 Dukinfield has a wonderful Town Hall, charming in a French sort of way. 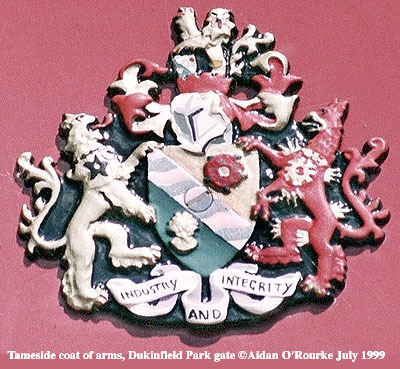 Next door is the impressive Dukinfield Park, built on a hillside. Continue up hill and down dale to Stalybridge, home of school chum of mine Peter Scullion - are you reading this? Here you'll discover a surpisingly attractive town centre currently under extensive renovation. 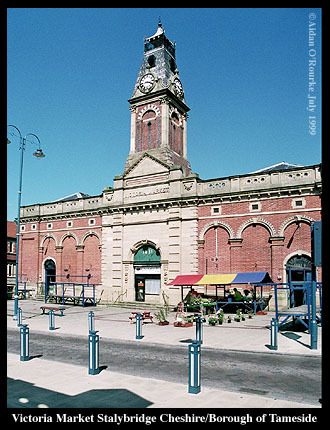 The Astley Cheetham Gallery houses temporary exhibitions and you'll also find the Local Studies Library here, with everything needed to discover the history of the whole of Tameside. The restored buffet bar is a great place to call in for a cup of tea or something stronger. 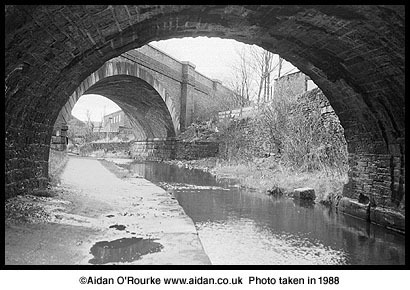 The Huddersfield Canal used to run through the town centre, but was filled in in less enlightened days. 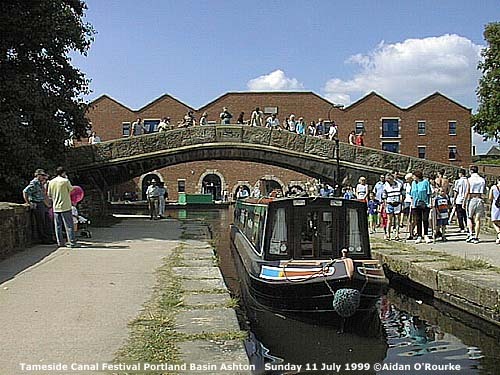 It's to be re-opened in a few years so canal boats can once again go from Huddersfield to Manchester. 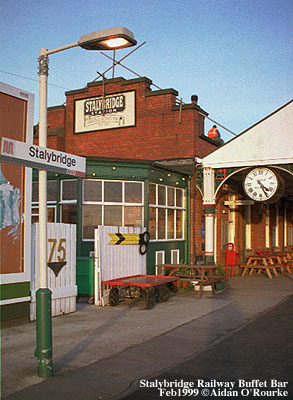 Take a left at Stalybridge and you're heading north along the Tame Valley, dividing the Lancashire part of Tameside to the west from the Cheshire part to the east. Road, rail, river and canal run parallel along the valley, leading to the town of Mossley. Keep going and you'll enter Oldham and eventually Yorkshire. Mossley has a spectacular valley and hillside setting. From deep down in the valley to high up on the hill is only a few minutes by car - longer on foot - and right at the top of the hill is Hartshead Pike, with superb views across the Manchester conurbation. 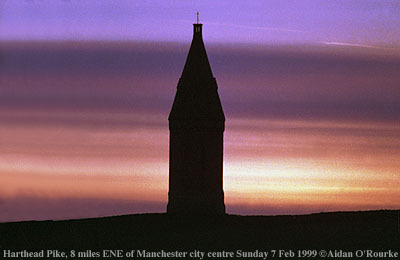 Standing on Hartshead Pike you feel like you could fly, so let's fly over to the east of Tameside and the "spooky" Longdendale Valley, for centuries Cheshire's far north eastern corner, now in the High Peak. Coming along the valley on the A57 from Sheffield, you enter Tameside near Bottoms reservoir. 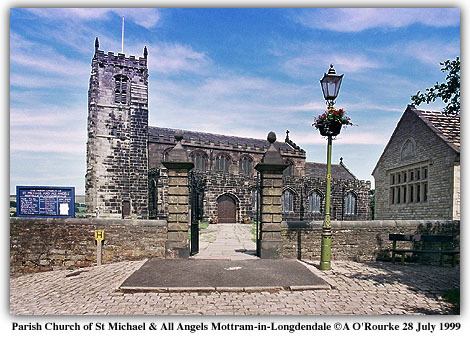 After passing through Hollingworth, you'll see the ancient Mottram Church sitting on a hilltop. 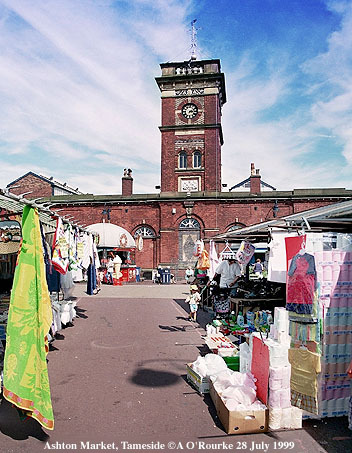 Don't be surprised if you get caught in a traffic jam here - this former medieval track is now the main link between Manchester and Sheffield. 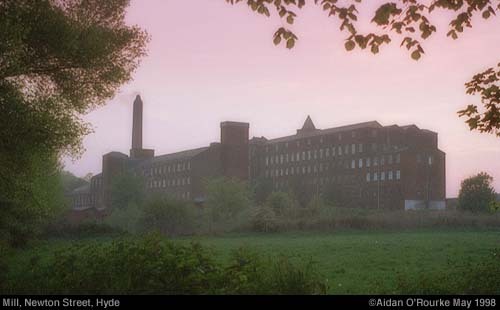 The River Etherow forms the south east border of Tameside - and at Broadbottom there's an amazing industrial heritage site: Broad Mills - the overgrown remains of a huge textile works which met its demise more than half a century ago. Exploring it is like rediscovering a Mayan city - not quite as ancient and exotic, but much cheaper to get to and no mosquitoes! I wonder what it's like at night! West of Mottram is the M67 roundabout - this motorway was planned to run from Manchester to Sheffield, but was never carried through. The only part to be completed runs from here through Hyde and Denton, stopping abruptly at the M60 short of the Manchester boundary. Taking the A560 south west, we pass Hattersley - one of Manchester's post war overspill estates. 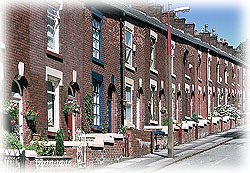 Like other government-funded housing areas, it has its share of problems, though with its semi-rural setting and direct rail link to Manchester, this ought to be a nice place to live. 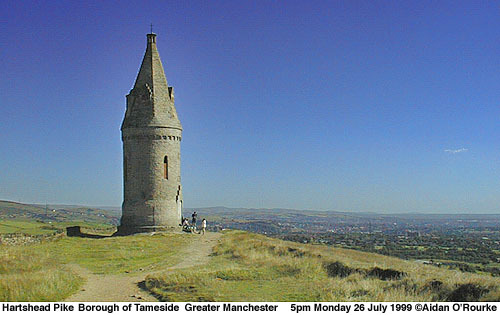 At Gee Cross, we're just below Werneth Low, despite the name, it's a hill with fantastic views west and south over the conurbation. Take a steep hill down and you're in Hyde, with its red brick town hall and colourful market. 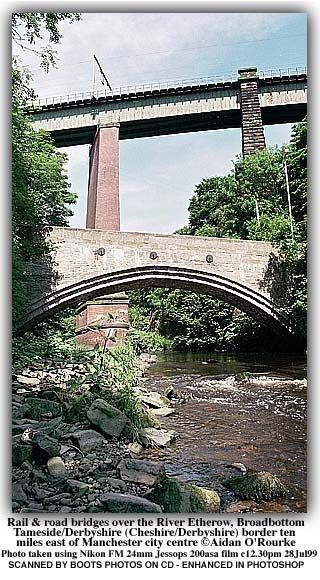 Straight on along the A57 and its down into a valley again to cross the River Tame, marking the old county boundary, as the inscription on the bridge bears witness. 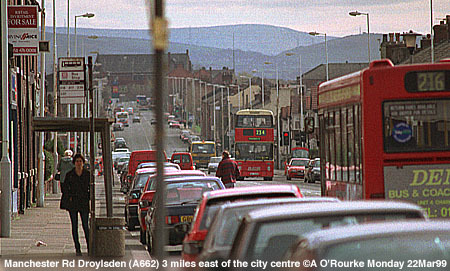 Up the hill again and you're in Denton, once a world-class centre for hat-making. As hats went out of fashion, the industry went into decline and so did Denton. - A new trading estate on the site of old factories and houses promises to raise the town's economic fortunes. See also the excellent local history books by writers Jill Cronin and Frank Rhodes. Straight on parallel to the M67 motorway and you're heading back towards Manchester - left at the big M60 roundabout takes you to Stockport, the next of the GM districts I'll be visiting. Across the roundabout to the right is Denton Golf Course, which in 1999 awaits possible redevelopment under a controversial plan recently re-named Waterside Park. 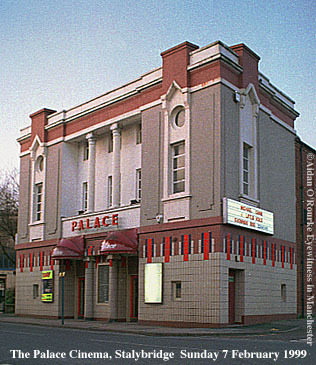 Yes, there's more to Tameside than meets the eye, and I've barely scratched the surface here - hope you'll take time out to explore the borough, and I promise you'll find many surprises - mostly pleasant! LESS THAN PLEASANT is a good description of recent news stories from Manchester - three fatal shootings have taken place in Moss Side - police are offering a 30,000 reward for information. The case of two men killed after falling from a window of the Ramada Renaissance Hotel in the city centre made national news headlines yesterday. Despite these incidents, I don't feel I'm in danger on the streets of Manchester. 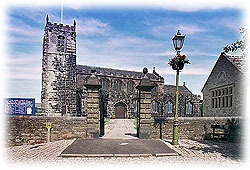 ST GEORGES CHURCH, Chester Rd which for years has lain derelict, is to be converted into flats. Sounds like the most feasible way of saving the building, but how would you like to live with all those graves outside your window? WHENEVER I GO AWAY, something's always different when I get back, and this time is no exception. 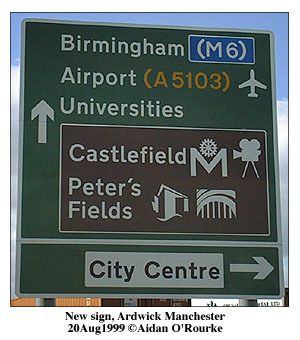 A new "field" has appeared in the centre of Manchester - alongside Castlefield, we now have Peter's Fields - There's always something new to discover in Manchester! PLEASANT AND SUNNY - that's what the weather was like in Manchester today, with daytime temperatures of high teens celsius, high 60's fahrenheit. Rain is forecast for later in the week.